Unfortunately, I usually use Twitter to see if other people are experience service outages for various services (like Gmail, Facebook…etc), but obviously, with Twitter down, I wasn’t able to do that. Perhaps because many of my friends aren’t active on Twitter, I didn’t even see any friends posting about the Twitter downtime. Update: It appears that the issue has been resolved. After looking a second time, it does not look like service has been fully restored yet. Update 2: “Service is restored” according to a tweet from Twitter Support a few moments ago. Retired New York Jets quarterback and Hall of Fame member Joe Namath flipped the honorary coin at tonight’s Super Bowl. He was wearing an “interesting” fur coat that surely attracted a lot of attention at home. It certainly caught the attention of people tweeting during the game, as “Joe Namath” is a trending topic on Twitter, which is quite an accomplishment during the Super Bowl. As you can see above, GoDaddy’s social media team jumped all over it. I am sure they are going for a viral tweet in the same way Oreo did with their Super Bowl tweet last year and Arby’s Grammy Awards tweet last week. We’ll see if this one goes viral. It’s going to be a big night for GoDaddy’s social media team. 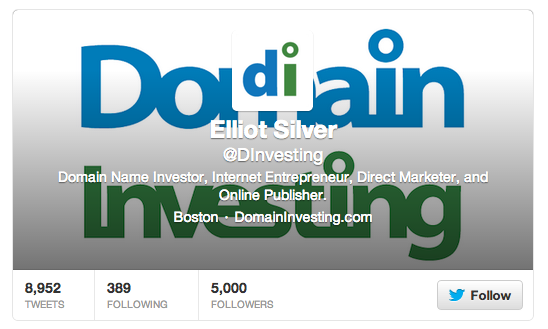 I am excited to see that my @dinvesting Twitter account now has 5,000 followers. I was late to adopt Twitter, but it has become one of my go to places for sharing links and having discussions with people. It has also been a great place to find content for blog posts and to learn about new resources to follow. I saw this excellent video and think it offers a valuable lesson that you might want to consider the next time you are using social media. It’s not a new video, but I think it’s well worth a watch when you have a few minutes to spare. Thanks to Charles Christopher for sharing this video. Several years ago, Moniker pretty much ruled the roost when it came to the preferred domain registrar of domain investors. The company was known for its security, but I think the primary reason for its popularity was because of the personal care company founder Monte Cahn gave to his clients. The underlying feeling was that if there was ever an issue, you could call or email Monte directly and the issue would be resolved ASAP. I was thinking about this when I discussed Voodoo customer support, and it got me thinking about the types of connections we have today. In addition to meeting account representatives and executives at conferences, I think relationships can be forged using social media options like Twitter and Linkedin. There are a number of companies that have great social media outreach, and I want to share some tips other companies may be able to use to connect with their customers on a more personal level and establish a relationship. With prices being so competitive and security fairly comprehensive at just about all domain registrars, it’s often a personal connection that gets customers to continue doing business. It’s no surprise that the majority of my domain names are registered at Enom and Go Daddy right now since I have account reps that have worked with me for years. Establishing and maintaining relationships is a critical part of this business, and companies should be using social media to engage with clients.